Get the most money for your trade-in! You Are Here: Home > Get the most money for your trade-in! Buying a new or used car can sometimes be financially stressful. There are ways to lessen that stress and make sure you get the best bang for your buck! Check out these great tips to get the most money for your trade-in! 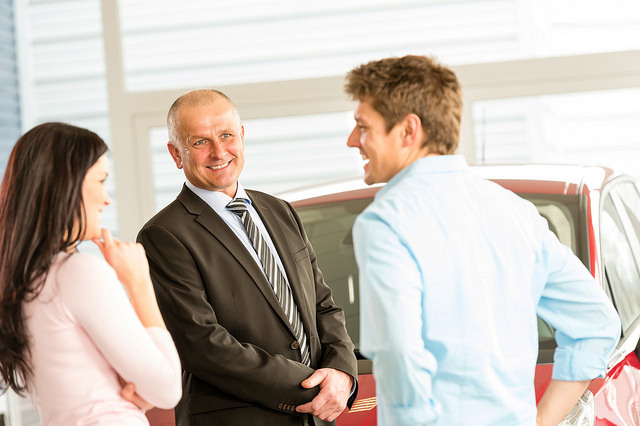 Make sure you look up your cars trade in value before you arrive to the dealership. There are many online tools you can use to judge what your car will be valued at. Anytime you sell your car, you can get more money for it by giving it a quick wash. Make sure you vacuum the interior, wash the wheels, scrub the bug guts off the windshield, anything you can do to make your old car look good as new—or close to! It’s not always the best idea to take all of your paperwork and belongings out of the car before you go to trade it in. This gives the dealership the impression that you are willing to let go of it immediately, no matter what. This gives the salesman the upper hand in negotiating. Leave some stuff in your car to show that you still haven’t made a decision whether you want to keep it or sell it. Dents and scratches are the first things that cause dealers to lower their offer price. Make sure to fix any small scratches or dents before you trade it in. They are cheaper than you’d think to repair and you will most likely earn the money back, possibly plus some, during the trade-in. Same goes for repairing any small mechanical problems that might get noticed during the appraisal process, such as headlights not working or the oil needing changed. If your tires have zero tread, consider getting new tires. You don’t have to get the most expensive set, just get a set that will get you through the appraisal process. Tire quality is always a negotiating point with dealers. After you complete these 5 steps, your car will be ready to get the most value out of its trade-in! Use our tool to find the value of your trade-in at Carriage Mitsubishi! By submitting this form you agree to be contacted by a Carriage Mitsubishi staff member.